Our Community 1st Visa Platinum Card is perfect for all of your everyday expenses. Not only will you recieve a low rate, but you have the support of excellent member services and extensive online support. Our Visa Platinum Card also has many features available to make this your favorite card! This benefit is designed to allow you peace of mind while traveling, knowing that your Community 1st Visa Platinum Card is on your side. Visa's Travel and Emergency Assistance can help you find a referral for medical, legal, and transportation assistance anywhere across the world. They can even help you with emergency translation services, emergency ticket replacement, and lost luggage locator services. Best of all, the service is free to all Visa cardholders! Use your Community 1st Visa Platinum cards on your next big purchase and Visa's Warranty Manager Service can extend the life of your existing warranty for up to three years! Once you have your new chip enabled Visa Platinum Credit Card or Gold Premier Equity Card activated, be sure to register for online access. Once you’ve registered, you’ll be able to track transactions, make payments and get access to detailed Visa information online—all by simply logging into eBranch and clicking on your Platinum Card or Equity Card. 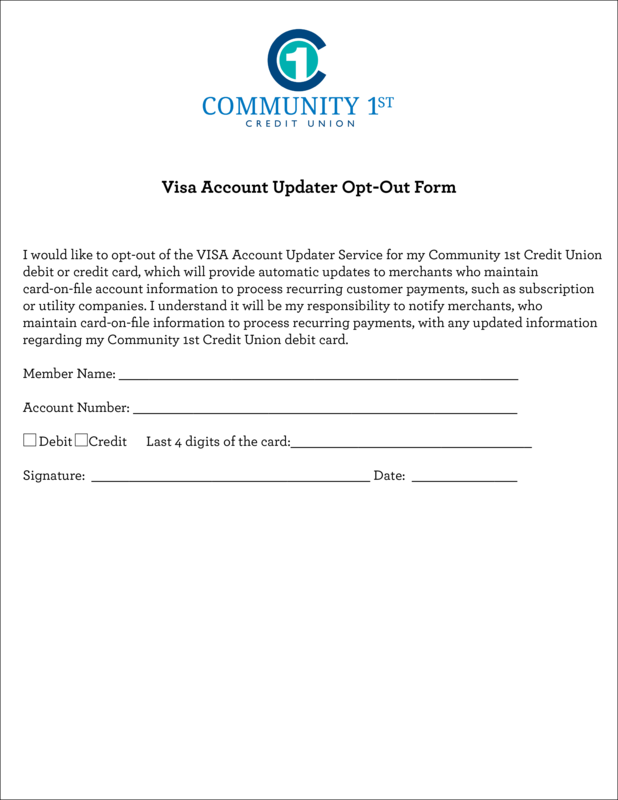 Visa Account Updater is a free service that allows Community 1st to update your information for you when you receive a new card number or expiration date. Rather than reaching out to update your information, it will happen automatically with all of your participating merchants. This means there is no risk of forgetting about a payee and possibly facing late fees, penalties, or even interrupted services. The best part is, you’re already enrolled! There’s no need to fill out any paperwork or follow any steps. Simply continue using your card as normal and when it comes time to replace it, we’ll take care of work.